The wind of change is blowing through clinical microbiology, not just in Africa but across the globe. Molecular techniques are revolutionising the routine identification and characterisation of pathogens, opening new opportunities and challenges in all areas of clinical microbiology from clinical diagnostics to fundamental research. This course will examine the impact of molecular approaches in the African context using a combination of lectures and tutorials and laboratory and computer practical sessions. The course will focus on bacterial pathogens of importance in Africa. 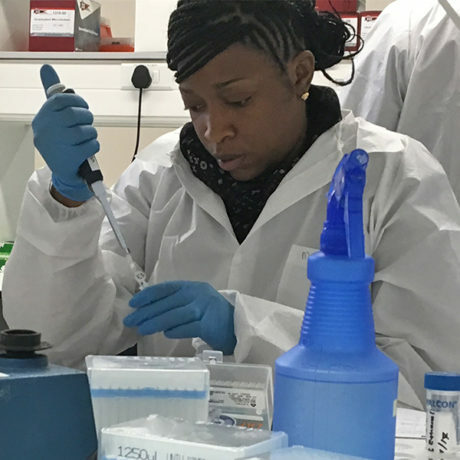 The intensive programme will provide clinical microbiologists and laboratory scientists working in Africa with a concise yet comprehensive overview of the latest research and practice in this essential area, with an emphasis on how these techniques can be applied day-to-day in an African setting, especially when resources are limited. There will be extensive opportunity to interact with the course faculty during the course. The course is aimed at those primarily trained in culture-based microbiology and combines an understanding of the latest research techniques and theoretical approaches, with practical methods to provide a foundation-level of understanding of the philosophy, methods, and specialist terminology of molecular techniques. The course is free to attend and open to applicants based in institutes in Africa. Applicants should have demonstrable experience in a relevant field (microbiology, specifically bacteriology) and be, clinical trainees or specialists in medical microbiology; postdoctoral scientists; senior technicians; or research assistants with a Master’s degree. Clinically qualified applicants are especially encouraged to apply. Fundamental molecular biology techniques including preparing, handling, and storing DNA. PCR, including real-time PCR, with an emphasis on, methods, applications and data interpretation. Determining sequence variation, its visualisation and interpretation, concentrating on conventional approaches. Bioinformatic analysis of molecular and genomic data, particularly the exploitation of web-based tools. An overview of future technologies, and their potential for application in clinical microbiology. Assess the strengths, weaknesses and limitations of different methodologies and approaches in clinical microbiology. Apply a range of genomic methods including real-time PCR and conventional sequencing. Create sequence data using next generation single molecule sequencing. The course is subsidised by the Wellcome Genome Campus Advanced Courses and Scientific Conferences Programme and is free to attend for non-commercial applicants. Please contact us for the commercial fee. The course is open to applicants based in institutes in Africa. Applicants should have demonstrable experience in a relevant field (microbiology, specifically bacteriology) and be clinical trainees or specialists in medical microbiology; postdoctoral scientists; senior technicians; or research assistants with a Master’s degree. Clinically qualified applicants are especially encouraged to apply. The course will be taught in English. Laboratory experience: The laboratory practical sessions will require basic microbiological and laboratory skills. Participants are required to have some previous exposure to basic microbiological and laboratory techniques. This will be essential for participants to fully benefit from the course. Computational experience: Participants should have some basic knowledge of computer usage. No formal bioinformatics training is required.